I have a winner of the Toy Giveaway I held with http://righttolearn.com.sg/ Congratulations to Nmhl, from Malaysian blog An On-line Diary to Share. She has won the the Wooden Toy Bricks ($25.90) she requested for her two young children. Nmhl stated in her comment that "My son likes to play with puzzle and blocks and with this toy, it will definitely keep him busy for a while. Puzzle are ideal to expand toddlers creativity and built up their confidence and patient". Well said. This is an excellent choice for small children and I'm sure these two little ones will be thrilled with their prize. Blocks Train because of its cute design and that it provides suitable activities (sorting, pushing, pulling, matching) for a toddler up to around 4-5 years old. Music Detachable Xylophone for my son. He loves to music and he loves to beat at things. Wooden Peg and Hammer-Knocking for my boy. He is very energetic and this toy would serve well to channel his energy. And I can train him early as an hands-on guy. Anatomy 4D Puzzle HUMAN BODY for my kids. It will be a fun and educational way for them to learn abt human body. Alphabet Train (Chunky Wood) because it provides a fun and colourful way for a toddler to learn alphabets, alphabet sequences and what word each alphabet can stand for - all in a hands-on manner (since my little boy has very short attention span with books!). Monkey/Bananas Math Balance because it provides a fun and yet practical way for preschoolers to picture, learn and understand the concept of addition and balancing the amount on one side to the other side's amount. Kinder Music Instruments Set 1 because it provides a variety of cause-and-effect actions for an infant/toddler to experience with. Gamewright Cards- K-9 Capers because it looks like a fun indoor game that doesn't take too long to finish considering my son has short attention span. Hoppers Thinkfun because I can foresee my hubby, my little boy and myself spending quality time together as a family playing this indoor game while at the same time allows my little boy to stimulate his thinking skills. Stacking domino as it allows for experimentation and develops problem solving skills. It's also great for fine motor skills development too - kids just love threading/stacking! ...not to mention the satisfaction when they somehow work out how to pop them all on! There is a variation in the local doctor's surgery and it always holds my son's attention... and mine! The 3D puzzle reminds me of the puzzles I hand painted and, cut and sanded myself as a Uni student - long gone are those days! Magnetic Mighty Minds tiles set as it provides children with the opportunity to really explore shapes. By providing templates to put the shapes onto, it shows the children different ways that shapes can be used. This then follows on to the children exploring themselves and discovering new ways to put shapes together to create different scenes/pictures. I like the fact that it is magnetic as something different... It is suitable for travelling - yay! and it can also be popped on the fridge! 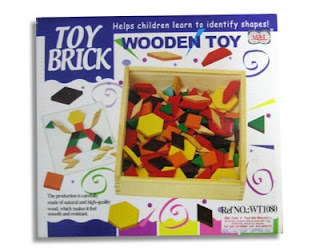 Those blocks are very useful to make shapes. I have a set for my boys too.